I just returned last weekend from the "International Guild of Realism" show in Santa Fe. It was a spectacular show and we had an amazing turn out. The show was held at the beautiful "Sage Creek Gallery" in downtown Santa Fe. If you missed the opening you can still preview all of the works on the gallery website or on the "International Guild of Realism" website. Many of the participating members and their guests were in attendance for the festivities. The honored guest judge John O'Hern, retired curator of the Arnot Art Museum of Elmira, NY presented the awards. My favorite part of the entire show and experience was meeting the various artists and making new friends. 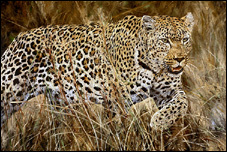 There is one wildlife artist in particular that I met named "Linda Besse." Linda is an amazing artist that has traveled the world to photograph and experience animals in the wild. She has traveled every state in the U.S. as well as 31 countries, and all seven continents. Besides being incredibly talented, she is one of the nicest people I have met in a long time. She is quite modest and genuine, and kindly offers advice if asked, and has some extraordinary stories to tell about her many adventures in the wild. The two images posted above are oil paintings by "Linda Besse." If you would like to see higher resolution images, please visit her website or blog. I'll attach the links below. She has also been juried into the "Birds In Art" exhibition at the "Leigh Yawkey Woodson Art Museum" numerous times which is one of my life goals these days. Check out her work when you get a chance, it is incredible! Thank you Barbara. I feel I am the fortunate one to meet you. I look forward to years of networking and tossing ideas back and forth.